On her first day at the Cloisters gallery in New York, where she has been employed as a restorer, Mackenzie Ferrara is introduced to Italian restorer Anthony Bataglia, who is recognised as a world leader in the field. 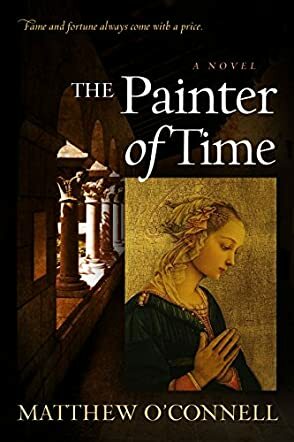 Painter of Time by Matthew O’Connell chronicles how, together, they begin work on restoring Berlinghiero Berlinghieri’s 1231 masterpiece, Madonna and Child, and how their relationship develops as they tackle a series of restorations on works by artists such as Daddi, Giotto and Filippo Lippi. Interestingly, the narrative also includes chapters dealing with the lives and times of the artists whose work they are restoring – descriptions of their work, their loves and fortunes during the thirteenth and fourteenth centuries in the Italian cities of Florence and Lucca. Understandably, Mackenzie is captivated by the Italian’s easy charm and gentle ways, but she starts to notice some puzzling irregularities in the work they are undertaking - subtle inconsistencies that lead her to suspect that Bataglia may not be all that he appears to be. After much soul searching, she decides to confide in her father, Joe Ferrara, a retired NYPD detective, and together they amass a disturbing body of evidence which could cast serious doubts on the credentials of Mr Anthony Bataglia and the integrity of many masterpieces hanging in galleries around the world. But could there be another explanation - could the truth be even stranger? Painter of Time is a brilliant piece of work; an evocative, carefully researched, well written narrative that will keep you enthralled from beginning to end. Intrigued by Matthew O’Connell’s story, I took the trouble of checking out some of the places, artists and masterpieces described in the book and, to my great satisfaction, found the underlying facts on which the storylines are based to be perfectly accurate. Because the book is basically a mystery, I will not go into too much detail, but I can confirm that I enjoyed it greatly and have no hesitation in recommending it. Read this book - you will not be disappointed.